The rheumatology program at NewYork-Presbyterian Hospital is comprised of faculty affiliated with Weill Cornell Medical College and Hospital for Special Surgery, and Columbia University College of Physicians and Surgeons. The program provides state-of-the-art care to patients with the broad range of inflammatory and autoimmune diseases, pursues groundbreaking research at both the laboratory level and through clinical studies, and offers comprehensive training to medical residents and fellows. The Division of Rheumatology at NewYork-Presbyterian/Weill Cornell Medical Center and Hospital for Special Surgery is comprised of faculty jointly appointed at Weill Cornell Medical College and Hospital for Special Surgery. 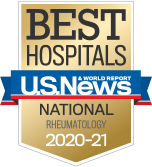 The Division is the largest rheumatology program in the country, with 31 full-time rheumatologists and 3 pediatric rheumatologists, seeing 9,000 new patients and 28,000 follow-up patients per year, providing both outpatient and inpatient care. The Division features an eight-bed infusion unit that accommodates over 4,600 treatments per year, and two dedicated beds for pediatric infusion, and administers state-of-the-art biologic therapies to patients with systemic autoimmune and inflammatory diseases. Division faculty lead 15 investigator-initiated and industry-sponsored drug trials per year, as well as more than 40 approved clinical research studies per year, giving patients access to medications not available elsewhere. The clinical and academic activities of the Division are organized around Centers of Excellence in Lupus and Antiphospholipid Syndrome; Inflammatory Arthritis; Scleroderma, Vasculitis and Myositis; Bone Health and Osteoporosis; Osteoarthritis; and Pediatric Rheumatology. As the most respected academic center focused solely on these medical problems, the Division provides many services that involve patients, including support groups (LupusLine, Charla de Lupus, and Myositis), patient newsletters and lectures to enhance the patient-physician relationship and improve patient outcomes. The clinicians of the Division of Rheumatology work closely with their colleagues engaged in laboratory research studies, particularly the investigators of the Mary Kirkland Center for Lupus Research, as well as orthopedic surgeons, to advance the care of patients with rheumatic diseases. The Division of Rheumatology at NewYork-Presbyterian/Columbia University Medical Center has a long and distinguished history in the study and treatment of rheumatic diseases and in the mentoring and training of leaders in the field of rheumatology. The Division's 12 rheumatologists treat the full range of autoimmune diseases and inflammatory disorders, including inflammatory arthritis, ankylosing spondylitis, vasculitis, together with polyarteritis nodosa and Wegener's granulomatosis, osteoarthritis, systemic lupus erythematosus, scleroderma, Sjogren's syndrome, and myositis, with polymyositis and dermatomyositis. In 2012, the Division's faculty had 1,416 new office visits and 4,556 follow-up visits, and its Infusion Unit treated 96 patients with multiple visits, totaling 600 infusions. Clinical services also include an injection clinic that employs ultrasound technology to allow for more targeted treatments. The Division embraces a philosophy of multidisciplinary and collaborative care, partnering with other medical specialties throughout NewYork-Presbyterian Hospital to develop effective treatment modalities and conduct research into future therapies. Here rheumatologists, scientists, orthopedists, cardiologists, nephrologists, and obstetricians/gynecologists work in concert to provide the highest quality patient care. With a high prevalence of systemic lupus erythematosus in the African-American and Hispanic communities of Northern Manhattan surrounding NewYork-Presbyterian/Columbia, the rheumatologists work closely with nephrologists and obstetricians to address the increased risk for renal disease and pregnancy loss brought on by the disease. A recognized leader in rheumatology and immunology research, the Division is involved in ongoing studies aimed at better understanding the mechanisms behind inflammatory and autoimmune disorders, with a major focus on rheumatoid arthritis and lupus, and currently has 18 clinical trials underway to provide valuable insight into the development of more effective treatments.